I first heard about this on Damsel of the Faith’s website. Bishop Fellay has announced a new Rosary Crusade, leading up to the 100th anniversary of the apparitions of Our Lady of Fatima. The first vision of Our Lady, to the three shepherd children Lucia, Francisco and Jacinta, was on May 13, 1917. The Miracle of the Sun occurred on October 13, 1917, and was witnessed by 70,000 people. The Rosary Crusade is to take place from August 15, 2016 to August 22, 2017. The announcement of the Rosary Crusade can be found on the SSPX’s website, HERE. The Society of Saint Pius X is looking for 12 million Rosaries to be said. In past Rosary Crusades, the Society of Saint Pius X has provided sheets where you can record the Rosaries said, and either turn them into your chapel, or if you do not attend an SSPX chapel, to send them into their central office. If there is such a sheet provided, I will link to it. 4. to consecrate their homes to the Immaculate Heart of Mary. And as a special intention we will add (IV) the protection of the Blessed Virgin Mary for the Society of St. Pius X and all its members in addtition to all the religious communities of Tradition. 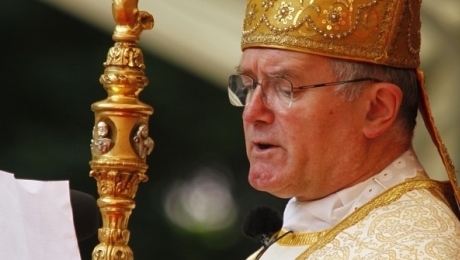 This entry was posted in Catholic, Catholic Church, SSPX and tagged Bernard Fellay, Bishop Bernard Fellay, Bishop Fellay, Catholic, Catholic Church, Rosary Crusade, Society of Saint Pius X, SSPX. Bookmark the permalink.